The Temple makes the whole house filled with divine power and positivity. There a number of designs available in Temples but Handcrafted Wooden temples are the most preferred type. The wooden temple has intricate carvings that resembles the Divine Temple structure that can be seen all over India. The craftsmen skillfully carved out detailed carvings bringing the whole Temple to life. This particular Temple is an example of the ingenious skill of Indian craftsmen. The Temple top portion consists floral carvings with half elephant designs.. The Garbgriha (Center of the Wooden temple where idols / deities is /are to be placed). Even the back of the Temple jaali design. The side of the Garbgriha has beautiful Swan design carved out and similar carvings extending till the base space. 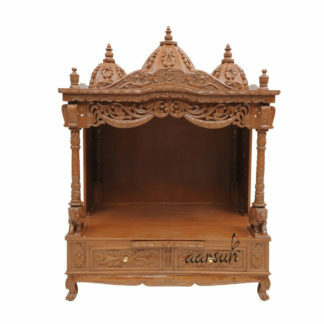 The base consists of single slider tray for Diya / Dhoop batti and one drawers for all your pooja elements at one place. Even the drawers and the surface surrounding them has similar floral carvings. The unit is a made to order design and can be polished as per your need. Also, the size can be changed according to your home / office requirements. Just give us a call or chat us now to get delivery time-frame and place a customization order. 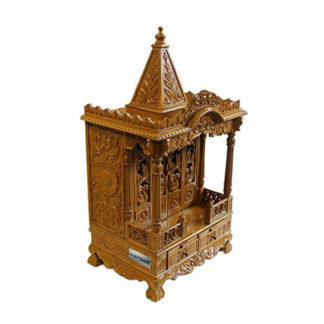 A wide range of Wooden Temple designs are available in Teak Wood Temple .